This is the second and last part of a series about difficult urban geography for public transit, following a Patreon poll. Part 1 covers narrow streets. A few years ago, Sandy Johnston remarked that Jerusalem had the least gridded street network he ever saw, and this complicates any surface transit planning there. At the time he was familiar with New England already, but Jerusalem seemed different. Boston has some gridded sub-areas, like Back Bay, but Downtown Boston is as messy as Jerusalem, and on the level of arterial streets, even the rest of the city isn’t too different. The real issue affecting Jerusalem is the hilly topography. Once one gets out of the core of West Jerusalem, the city turns into a mess of hills with internal street networks and poor connectivity between them. Boston maintains a coherent structure of arterial streets that host buses and tramways, with a cobweb structure that feeds the subway efficiently; in Jerusalem, there is little chance of that. Rapid transit is mostly insensitive to hills. A subway can be built across hills, partly underground, partly elevated. This is the case in Upper Manhattan, where the 1 train runs in a mix of cut-and-cover subway, elevated structures, and mined deep-level tunnel. Even if the hills slope down into the natural arterial, this is not such a problem. Train stations can incorporate escalator access and have exits at different elevations. New York manages this in the same neighborhood where the 1 runs, in Washington Heights, on the A train. Monaco, on a sloping hill, manages the same at its train station, which is located underground, using elevator access from multiple neighborhoods at different altitudes. The deep mining required for such construction doesn’t even raise costs that much. If it’s possible to secure horizontal access to the station site, construction becomes easier. Moreover, running elevated through the valleys, as the 1 does in Manhattan Valley and Inwood, cuts costs rather than increasing them. Evidently, the hilliness of Rome has not prevented the city from building a subway. Line C’s construction costs were very high, but not because of topography but because of millennia-old archeology, which is not really a question of the street network. Since rapid transit is not affected as much by hills as surface transit, a city with hilly topography should be biased toward rapid transit and against surface transit. This does not mean every flat city should be content with surface transit and every steep city should build subways and els, but it does mean that the population and density thresholds for rapid transit are smaller in hillier cities. Some cities are very hilly, but this does not affect their street networks. San Francisco is famous for this: north of Market, in neighborhoods like Telegraph Hill and Russian Hill, the street grid continues mostly uninterrupted, and the result is famously steep streets. 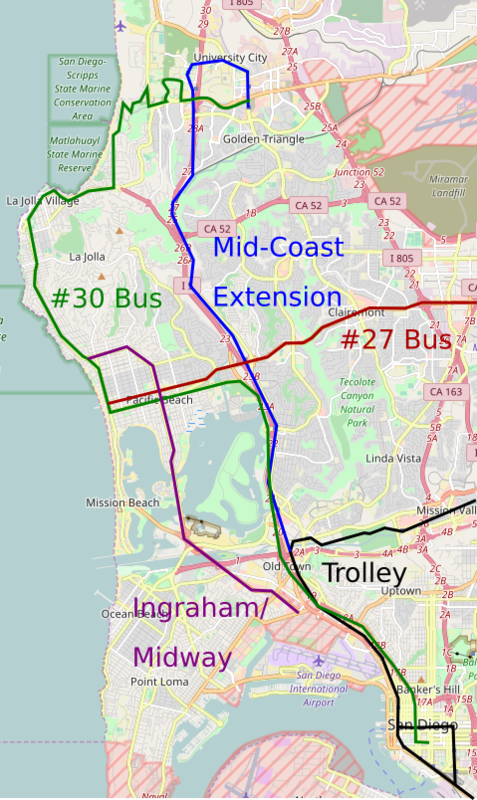 In these cities, transit network planning need not pay much attention to the topography: the only concession that need be made is that agencies should preferentially electrify and run trolleybuses, which have better hill-climbing performance than diesel buses – as San Francisco Muni in fact has, retaining trolleybuses rather than replacing them with diesels as nearly all other American cities have. The more interesting and difficult case is when the street network respects the hills. It can naturally turn the city’s street layout into that of multiple distinct pods, each surrounding a different hill. This is popular in Jerusalem, especially the settlements within East Jerusalem, but also in some of the newer parts of West Jerusalem. There is not much connectivity between these different pods: there may be a single arterial road with the rest of the city, as is the case for the settlements of Pisgat Ze’ev, Ramot, and Ramat Shlomo. This kind of pod development is popular in a lot of auto-oriented suburbia. The cul-de-sac is a defining feature of many an American suburb. However, in Jerusalem we see it happen even in the context of a dense city: Jerusalem proper has a density of 7,200 people per square kilometer, and all the settlements in question are within the jurisdiction of the city. It comes out of a combination of modernist central planning (Israeli neighborhoods and cities are designed top-down, rather than expanding piecemeal as in North America or France) and the hilly terrain. Transit planning for such a city is a chore. In theory, choke points are good for transit, because they have high intensity of travel, where dedicated lanes can make buses very efficient. In practice, choke points work for transit only when there are coherent corridors on both sides for the buses to feed. For example, on a wide river spanned by few bridges, buses can run on the bridges, and then continue on the arterials feeding them on either side. Pod development, in contrast, has no coherent arterials within each pod, just collector roads feeding the main drag. Buses can still run on these streets, but there is no structure to the density that encourages them to serve particular locations and not others. One solution is a type of transit that is overused in flatter cities: the direct express bus, or open BRT. This bus runs local within each pod and then continues on the arterial, making few stops; it could run as open BRT if the arterial has enough development to justify such service, or as a nonstop express service if it is a full freeway. This form of transit developed for both low-density American suburbia and Israeli pod development towns (where this is buttressed by the tendency of the ultra-Orthodox to travel in large families, in which case transfer penalties are much higher, encouraging low-frequency direct service). Another solution is to go in the air. Gondola lifts are seeing increasing use in extremely hilly cities, where surface transit must wend its way through switchbacks. Medellin’s Metrocable has a vertical rise of 400 meters. Even in cities that are less steep, gondolas could be a solution if arterial roads are simply not available. In the Arab neighborhoods of East Jerusalem, arterials are rarely available, and gondolas bridging ravines could be of use. Gondolas could also be useful for neighborhoods that are only connected by arterial in a radial rather than circumferential direction – they could again bridge ravines to connect peripheral neighborhoods to one another rather than just to the center. Vancouver is going to open the Evergreen Line at the end of the year, an 11-km SkyTrain branch to Coquitlam with a projected ridership of 70,000 per weekday; current ridership on the B-line bus paralleling the route, the 97, is 11,000, the 20th busiest citywide (see data here). New York is going to open the first phase of Second Avenue Subway at the end of the year or early next year, a total of 4 km of new route with projected ridership of 200,000 per day (see pp. 2-3). The bus running down First and Second Avenues, the M15, has 46,000 weekday riders, trading places with two other routes for first citywide, but first phase only covers a quarter of the route, and the ridership projection in case the entire Second Avenue Subway is built is 560,000; nobody expects the other two top bus routes in New York, the B46 on Utica and the Bx12 on Fordham, to support such ridership if they’re ever replaced with subways. In Boston, the Green Line Extension northwest in Somerville is projected to have 52,000 weekday riders by 2030. There is no single parallel bus, but a few buses serve the same area: the 101 with 4,800 weekday riders, the 89 with 4,200, the 88 with 4,100, and the 87 with 3,800 (all bus ridership data is from the Bluebook, PDF-pp. 48-54); the busiest of these ranks 28th regionwide. In all three cases, I think the ridership estimates are reasonable. Vancouver especially has a good track record, with Canada Line ridership meeting projections; it’s harder to tell in New York and Boston, which have not opened a rail line recently (New York’s 7 extension was just one stop, and its predicted ridership explicitly depends on future development). Since in general I do think cities should plan their rail extensions around where the busiest buses are, I want to talk about the situations that create a disjunction. I mentioned in two past posts that rapid transit that surface transit and rapid transit alignments obey different rules, with respect to street geometry. In the more recent post, I used it to argue that tramway corridors should follow buses. In the older post, I argued that subways can take minor detours or go under narrower, slower streets to reach major destinations, for example Century City in Los Angeles, which is near the Wilshire corridor but not on it. However, the latter case isn’t quite what’s happening in any of the three examples here: Second Avenue Subway follows Second Avenue (though phases 1-2 diverge west to serve Times Square, which is important), and the Green Line Extension and Evergreen Line’s routes are both straighter than any bus in the area. The situation in Boston and Vancouver is not that there’s an arterial bus that misses key destinations. Rather, it’s that the street network is inhospitable to buses. Boston is infamous for its cowpaths: only a few streets, such as Massachusetts Avenue, are wide and long enough to be reasonable corridors for arterial buses, and as a result, the bus network only really works as a subway feeder, with very high rail to bus ridership ratio by US standards. The corridors that do support busier buses – in the Greater Cambridge sector, those are the 77, 71, and 73 buses – are defined by the presence of continuous arterials more than by high latent travel demand. Vancouver, of course, is nothing like Boston. Its bus grid is Jarrett Walker‘s standard example of an efficient, frequent bus grid. But this is only true in Vancouver proper, and in parts of Burnaby. In the other suburbs, either there’s an arterial street grid but not enough density for a good bus grid (Richmond, Surrey), or there’s no grid at all (Coquitlam). There’s a bus map of the Port Moody-Coquitlam area, with the 97-B line in bright orange and the 5-roundtrips-per-day West Coast Express commuter rail line in purple; the Evergreen Line will run straight from Port Moody to Coquitlam along an alignment parallel to the railroad, whereas the 97-B has to take a detour. Overall, I would class Coquitlam and Somerville together, as places where the street network is so bad for buses that rail extensions can plausibly get a large multiple of the ridership of existing buses. Second Avenue Subway phase 1 partly belongs in this category, due to the difficulty of going from Second Avenue to Times Square by road, but high projected ridership on phase 3 suggests something else is at play as well. While First and Second Avenues are wide, straight throughfares, functioning as a consistent one-way pair, two factors serve to suppress bus ridership. First, Manhattan traffic is exceedingly slow. The MTA is proud of its select bus service treatments, which boosted speed on the M15 between 125th and Houston Streets to an average of about 10 km/h; in contrast, the Bx12 averages 13-14 km/h west of Pelham Bay Parkway. And second, the Lexington Avenue Line is 360 meters, so riders can walk a few minutes and get on the 6 train, which averages 22 km/h. The Lexington trains are overcrowded, but they’re still preferable to slow buses. Now, the closeness to the Lexington trains can be waved away for the purposes of the principle of this post: I am interested in where preexisting transit ridership is not a good guide to future transit ridership, and in this example, we see the demand via high ridership on the 4, 5, and 6 trains. However, the issue of slow Manhattan traffic can be folded generally into the issue of circuitous street networks in Boston and Coquitlam. It makes intuitive sense that the higher the bus-to-rail trip time ratio is, the higher the rail line’s ridership is relative to that of the bus it replaces. But what I’m saying here goes further: the two mechanisms at hand – a street network that lacks continuous arterials in the desired direction, and extensive traffic congestion – reduce the effectiveness of any surface solution. Is it possible to build tramways in the Vancouver suburbs? Yes. But in Coquitlam (and in Richmond and Surrey, for different reasons), they would be circuitous just like the buses. This also limits the ability of bus upgrades to solve transportation problems in such areas. Now, what of New York? In theory, a bus or tram with absolute signal priority could run down the Manhattan avenues or the major outer-borough throughfares at high speed. But in practice, there is no such thing as absolute signal priority on city streets. It’s possible to speed up surface vehicles via signal priority, but they’ll still have to stop if cross-traffic blocks the intersection. In Paris, the tramways are not fast, averaging around 17-18 km/h, even though they have dedicated lanes and run on wide boulevards in the outer parts of the city and in the inner suburbs; in contrast, Metro Line 14, passing through city center, averages almost 40 km/h. The implication here is that when a city develops its subway network, it should pay attention not just to where its busiest surface lines are, but also to which areas have intense activity but have suppressed surface ridership because the roads are slow or circuitous. These are often old city centers, built up before there were cars and even before there was heavy horse wagon traffic. Other times, they are general areas where the road network is not geared toward the desired direction of travel. In cities without subways at all, there is a danger of overrelying on surface traffic, because such cities often have old cores with narrow streets, with intense pressure for auto-oriented urban renewal as they get richer. This is less common in the developed world, but nearly every developed-world city of note either has a rapid transit network already or is completely auto-oriented and has no areas where the road network is weak. Israel supplies several exceptions, since its transportation network is underdeveloped for how rich it is; in past posts I have already voiced my criticism of the decision to center the Tel Aviv Subway around wide roads rather than the older, often denser parts of the city. In cities with subways, it’s rarely a systemic problem. That is, there’s rarely a specific type of neighborhood that can support higher rapid transit ridership than preexisting transit ridership would indicate. 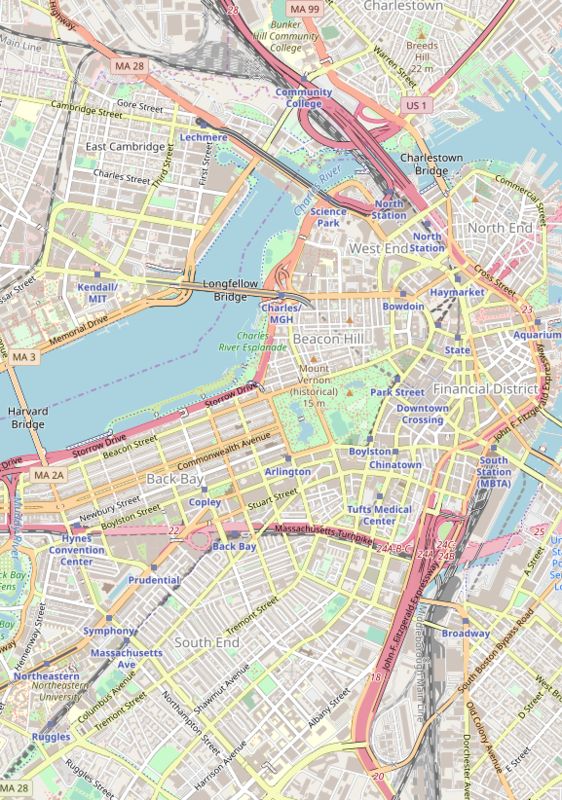 It depends on local factors – for example, in Somerville, the railroads are oriented toward Downtown Boston, but the streets are not, nor are they oriented toward good transfer points to the subway. This means transit planners need to carefully look at the road network for gaps in the web of fast arterials, and consider whether those gaps justify transit investment, as the GLX and Evergreen Line do. Small, dense developed countries should electrify their entire national rail networks. Usually, railroads think in terms of electrifying lines, but this hides the systemwide benefits of transitioning the entire network to run under electricity. I have previously written about this in the context of regionally funded commuter rail systems, as have Paul Druce and Clem Tillier. But some countries are so small and dense that the analysis for a single large metro area holds nationwide as well. In this post I am going to focus on Israel, which is completely unelectrified, but also foray into mostly-electrified Belgium and the Netherlands, and currently-electrifying Denmark. Switzerland has already completed electrification; it is less dense than all of those countries except Denmark, but has cheap hydro power, which makes it cheaper to run trains under electricity, and key mainlines through mountainous terrain, where electrification is a major performance booster. First, let us recall the performance benefits of electrification in flat terrain. The major rolling stock manufacturers sell DMUs with top speeds of 120-140 km/h, and EMUs with top speeds of 140-200 km/h; faster trains are generally more expensive, and with a few exceptions not of much use outside dedicated high-speed rail lines. The difference in acceleration performance is large: when the top speed is 100 km/h, an EMU such as the FLIRT takes less than 30 seconds to accelerate from standstill to top speed, corresponding to an acceleration time penalty of about 14 seconds, whereas the Stadler GTW DMU has a penalty of about 28 seconds (see data on PDF-p. 43); the GTW EMU version, a less powerful train than the FLIRT, loses 19 seconds. DMUs are also less comfortable than EMUs, because the diesel engines are right under passengers’ feet; longer-distance lines almost never use them, and instead use diesel locomotives, which accelerate even more slowly. Because of this large difference in acceleration performance, electrification delivers the greatest performance benefits on lines with closely-spaced stops and high traffic. These are usually commuter rail lines rather than intercity lines. For example, suppose the top speed is 130 km/h, the stop spacing is 3 km, station dwell times are 30 seconds, and schedules are padded 7%. The FLIRT’s acceleration penalty is about 19 seconds, that of the diesel GTW (to 125 km/h) is 43 seconds; the deceleration penalties are both a bit lower than the acceleration penalties, but not too much lower, to avoid overheating. An EMU will average 68 km/h, a DMU 52 km/h. Independently of comparative energy and maintenance costs, this represents a 23% cut in the rolling stock requirement and in the on-board labor cost, and a larger cut in the required subsidy thanks to higher ridership. In contrast, if the stop spacing is 50 km, the difference in speed shrinks to 116 km/h vs. 113 km/h. Even if the EMU can do 160 km/h, its average speed is 140 km/h, still a smaller percentage difference than in the case of commuter rail, while the cost of providing this higher average speed is larger because tracks need to be upgraded to a higher top speed. In small countries, short stop spacing is the normal state of affairs. In Israel, few segments of track have stops spaced more than 10 km apart, and those are mostly on the under-construction high-speed line from Tel Aviv to Jerusalem, which is planned to host 200 km/h electric trains. In the Tel Aviv and Haifa metro areas, stop spacing in the 3-4 km range is normal. Even intercity trains make all stops within Tel Aviv and Haifa proper, skipping the stations between those two cities. There are no major cities north of Haifa, only suburbs and small cities, and thus making many stops in and north of Haifa is justified for intercity trains – there aren’t many through-passengers who are being inconvenienced. South of Tel Aviv there are some moderate-size cities (as well as Jerusalem, but the legacy rail line to it is so curvy that the train from Tel Aviv takes twice as long as the bus), but because of high traffic, all trains make all four Tel Aviv stops. With the exception of Belgium, all four countries under discussion also have dominant primate city regions, with about 40% of their respective national population; those city regions have dense rail networks, which are electrified in all countries except Israel. Denmark runs the Copenhagen commuter lines as a separate S-tog from the rest of the network, but in the Netherlands, Israel, and Belgium, there is no sharp difference. The result is that a large fraction of the overall rail network is urban commuter rail, which should be electrified, while additional chunks are regional rail with enough frequency to justify electrification even without a large city in the center. Moreover, the service pattern makes it hard to electrify just a few lines in isolation, even if they’re the busiest. Regional rail networks frequently employ through-running. In small countries, this is common for the entire rail network, for different reasons: in Israel, the route through Tel Aviv is a new line from 20 years ago, without many platform tracks for terminating trains, whereas in the Netherlands and Belgium it’s the result of a highly nonlinear population distribution, which favors a mesh of lines, such that busy routes share tracks extensively with less busy ones. Compare these population distributions with that of the Northeastern US, where there is clear division into a trunk from Washington to Boston and branches heading inland. Finally, these are all small countries. This is why I am not including South Korea in this proposal, even though it is denser, more mountainous, and more primate city-centric than all countries under discussion: South Korea is large enough that it’s plausible to run the Seoul-area commuter rail as an isolated electrified system, keeping the remainder of the legacy network unelectrified, with several maintenance shops for diesel trains around the country. In contrast, the unelectrified portion of the Dutch rail network consists of isolated branch lines, making it less economic to keep operating diesel trains. Israel has no electrification at all, but if it electrifies the Tel Aviv and Haifa commuter trains, the remainder of the network will be disjointed, requiring inefficient solutions such as considerable deadheading, or regular runs of diesel trains under long stretches of catenary. One example I keep harping on, which I got from The LIRR Today before its blackout, is the LIRR’s diesel runs. The LIRR is almost completely electrified, and its diesel branches see little service, especially at the easternmost end of Long Island. Between this and work rules that separate diesel and electric train crew, the crew on one of the diesel trains work 2.5 hours per workday, running a train once in one direction and deadheading the way back; this and the bespoke nature of diesel trains on the LIRR lead to high operating costs. The situations in the countries in question are not as comical as on the LIRR, but there are bound to be inefficiencies in Belgium and the Netherlands, and soon to be Denmark, which is electrifying its main lines, which together with the S-tog are a majority of its network. In Israel, the situation is the worst, since its rail network is even smaller: 1,100 km, compared with 2,600 km in Denmark, 3,600 in Belgium, and 2,900 in the Netherlands; this means that a partially electrified situation involves even smaller train orders and higher operating costs, while an entirely unelectrified network involves poor service in the urban areas. Israel also has no rail links with any of its neighbors, nor any plans to construct any. This means that its branch lines are truly isolated, unlike those of the Netherlands, Belgium, and Denmark, which sometimes connect to other unelectrified lines in neighboring countries. The way out of high diesel operating costs is to spend the money on completing electrification. As the example of Denmark shows, the costs are not outrageous: about $1.1 million per kilometer (I do not know whether track- or route-km, but I believe this is track-km). In the case of Israel, whose rail network is almost entirely single-track, this is not much more than $1 billion either way; to put things in perspective, the projected cost of the first Tel Aviv subway line is now up to $4.2 billion, while the Ministry of Transportation’s overall budget is $3 billion per year (PDF-p. 10), mostly spent on roads, in a country with only 300 cars per 1,000 people. All-diesel railroads resist electrifying their busiest lines because they prefer to be able to let every train substitute for any train, and, for smaller operations, maintain all trains in one yard. For the same reason, small railroads with high traffic, such as the national railroads of dense countries, should instead go all-electric, in order to retain the benefits of interchangeable trains and maintenance facilities while also capturing the benefits of electrification. It’s not terribly relevant to the countries I’ve recently lived in, but for the same reason Switzerland fully electrified, similar small, dense countries should do the same. I have been thinking of alternatives to the current plan for a Tel Aviv Subway for several years now; last year I expounded on some principles for a better plan. As I mentioned last year, Tel Aviv’s subway system should be shaped roughly like the letter E, with a single north-south spine paralleling the rail mainline and three east-west lines intersecting the mainline at the city’s three main train stations. Today I would like to give more details about this system, with special focus on commuter rail. While thinking of how to create an optimal system serving the region’s secondary centers, I came upon an important principle used on the Paris RER and the Zurich S-Bahn, which past posts (including my own) on the subject downplayed in favor of city-center tunnels: namely, it is often correct to deviate from legacy alignments for a few kilometers in order to better serve a secondary center, even if it requires some greenfield tunneling. Before I go on, I will note that this plan is intended to be politically neutral, in the sense of serving the dense primary and secondary urban centers of Gush Dan regardless of ethnicity, and with only weak regard for income. In my view, if there are anti-government riots in response to police shooting of a young minority, this is not a reason to deny service to the area; on the contrary, denial of social services is what creates the social alienation that contributes to rioting. But more than this, this plan assumes everyone travels to the same destinations, a reasonable approximation in a country with the level of social integration of the US or a monolingual European country, but a problematic one in Israel. About 18% of Israel’s population is Arab, and another 12% is ultra-Orthodox; both groups are highly segregated, and have their own job centers. On 972Mag’s Hebrew-language sister site, Noam Sheizaf reports that MK Hanin Zoabi (the Knesset’s sole Arab woman), best-known for her incendiary rhetoric against the IDF, criticized the state’s emphasis on developing fast transportation to Tel Aviv on the grounds that Arabs, especially Arab women, typically work close to home. Incomes are much lower than those of mainline Jews as well: I have no ultra-Orthodox data, but making mild assumptions on income distribution within each decile from Central Bureau of Statistics data, per capita income from work is about $6,000 per year for Arabs, a bit higher than Romania excluding Bucharest, and $16,500 for Jews, a bit higher than Greece or Southern Italy. The best American analogy I can think of is the development of dedicated buses for Chinese immigrants in New York City proper and ultra-Orthodox Jews in the New York area, as both groups are very poor and have different centers bypassing Midtown and Lower Manhattan. * The circumferential service running along the Eastern Line loops to serve Elad better. * There is a new branch into Kafr Qassem, passing much closer to Rosh HaAyin’s built-up area than the current Rosh HaAyin North station does. * The Kfar Saba branch is completely redone. There are plans to connect it to the Coastal Railway concurrently with building a freeway along the same alignment, going due west from its current terminus alongside Route 531. The freeway should be scrapped – Israel is building too many of them, and insists of bundling every transit project with a freeway (even the currently proposed Red Line is planned to come together with a freeway tunnel through an alignment near Jaffa Road in South Tel Aviv, forcing the line to go deeper and raising its costs). Moreover, the connection west of Kfar Saba should be more direct. Conversely, east of Kfar Saba there is a right-of-way that can be used to send trains up to Tira, and perhaps farther into the Triangle, into Tayibe or Qalansawe. * There is a new branch to Glilot and Herzliya Pituah, an edge city located a bit too far from the Herzliya train station to be a comfortable walk, especially along the wide, pedestrian-hostile access road. * The line enters Netanya along a new alignment, with a short tunnel; the current Netanya station is at the edge of the built-up area. * There is a reactivated branch serving Tsrifin. * The route through Rishon LeZion avoids the current plans to connect Rishonim Station (Kiryat Simha on my map, to avoid confusing with Ramat HaSharon Rishonim) to the Ashdod Branch via Route 431, avoiding the Rishon LeZion built-up area. Rishon is a sprawling suburb, but has more than 200,000 people, and secondary centers; it is better to spend a bit more money, tunneling under the center of the city and going above-ground to its west to serve the College of Management Academic Studies, Israel’s largest independent (i.e. non-university) college. These short tunnels are in line with construction in European cities: the Paris RER’s centerpiece is the connecting tunnels in central Paris, but as seen on this map, which includes chronology, the Charles-de-Gaulle branch opened in 1976, shortly before the RER B it connects to, and the Disneyland branch opened in 1977, concurrently with the RER A. The Zurich S-Bahn includes short greenfield tunnels to access the airport from both directions. The Stockholm commuter rail system includes a tunneled loop serving Arlanda, which was built for the Arlanda Express and then extended and used by the regular commuter trains. Usually these new tunnels serve airports or other new centers such as Disneyland, since the old secondary centers already have legacy lines, but in Israel, most towns’ train stations are located at the edge of the built-up area rather than in the center, and in the larger secondary cities, this justifies some additional tunneling. On the same principle, the Jabotinsky subway line, which is otherwise elevated outside the Tel Aviv core, tunnels to reach central Petah Tikva, in lieu of the current plan to skirt the center of the city and go in tram mode to Petah Tikva Central Bus Station. I expect most ridership, and by far most of the cost, to come from the subway lines, colored red, green, blue, and yellow; I call them subways, but out of the system’s 60 km, 27 are above ground and only 33 are underground, mainly in Tel Aviv proper and in the parts of Ramat Gan and Givatayim that do not have wide roads for a right-of-way. I chose names for political reasons: the north-south line is called the Jaffa Line since it passes through Jaffa, a low-income left-wing Arab area; the northern leg of the E is called the Jabotinsky Line since it runs largely along streets named after Zeev Jabotinsky, founder of Revisionist (right-wing) Zionism; the central leg of the E is called HaShalom Line since it intersects the mainline at HaShalom train station, and the peace process (shalom in Hebrew) is a cornerstone of the Zionist left; and the southern leg of the E is called HaTikva Line since it passes through HaTikva, a low-income right-wing Mizrahi neighborhood. I tried to steer clear of politics in the route choice: only the choice of names, constrained by the need to refer to features of the lines, is political. In the remainder of the post, I will deal with possible objections to the proposal, and with various doubts and drawbacks. 1. Probably the biggest objection I expect is that the system skirts the proposed Tel Aviv CBD, which is District 6 on this map. Unlike the current plan, there are no tunnels under Namir Road, but rather the tunnels are farther west, in the city’s traditional center. This is deliberate. I do not have bus traffic data, but I do have frequency data for the most frequent buses, expressed in daily departures in both directions. It is in Hebrew on the Israeli Bike-to-Bus Rider blog; the key is that a gold medal denotes at least 4 buses per hour, a bronze one denotes at least 3, a silver one denotes at least 3 and at least 4 at and on the shoulders of the peak, and a V on the left column denotes at least 6 at rush hour. The bus route numbers are on the second column from the right. See also this frequent bus map to match route numbers to streets. While I criticized the use of bus corridors for subway planning last year, noting that buses serve the wider Jerusalem Boulevard through Jaffa and not the narrower but more centrally-located Yefet Street, the map provides a rough guide to which regions and which directions of travel have the most demand. North-south travel along Ben Yehuda, Dizengoff, and Ibn Gabirol Streets and Namir Road is very popular. Ben Yehuda’s routes 4, 104, and 204, which HaTikva Line roughly parallels, have 642 buses per day. Dizengoff’s routes 5, 39, 72, 129, 172, and 239 have 1,071. Route 9, which runs along Ben Yehuda and Dizengoff in a one-way pair, has 162. 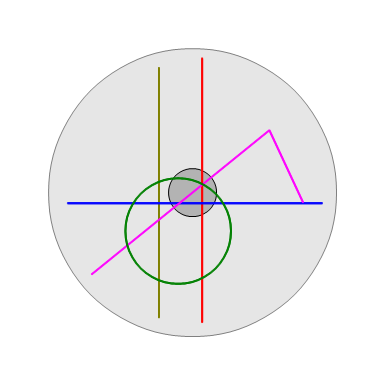 Ibn Gabirol’s routes 24, 25, 125, 126, 189, and 289 have 986. And Namir Road’s routes 1, 40, 42, 51, 60, 71, 160, 171, 240, and 271 have 1,726. Despite the large number of buses on Namir, these buses closely parallel mainline rail, and moreover, there are 65% more buses on Ibn Gabirol and points west. 2. My plan ignores many active plans made by the state. This is on purpose: until such projects as combined freeway-rail lines are built, they should be opposed, since the road construction will ensure connectivity by road will be faster than by rail, frustrating any attempt to maintain a high public transit mode share. To my understanding, the most expensive portions of the planned subway, namely the underground parts, have not been built, and on the contrary there are constant schedule and budget slips; the current timetable calls for the completion of the Red Line in 2023, and the budget has slipped from 10.7 to 14 to 17 billion shekels; this is $200 million/km, accounting for PPP but not future inflation (if Israel holds to 2% inflation, it will be about $180 million/km), for a line that’s only 43% underground. 3. Four-tracking the mainline rail route through Tel Aviv is going to be expensive, since it requires building over or rerouting the Ayalon River. In the long run, rail growth makes such construction necessary: Israel’s economic geography forces all travel between the north and the south to go through or right next to Tel Aviv, which means potential travel demand is higher than through Stockholm, which is currently four-tracking its main route through T-Centralen to provide for both additional commuter rail and intercity rail service. In the short run, there are two ways to cut initial costs. First, it may be the case that there is room for four tracks along the Ayalon right-of-way, as long as only two are served by station platforms. If that is true, then HaShalom should be reconfigured as a local station, with two nonstop tracks, while all trains should continue to stop at Tel Aviv Center and HaHagana, both of which already have more than 4 tracks. While HaShalom is Israel’s second busiest train station (see file here, shared by a forum member back in 2008: the leftmost column is total daily entries and exits), high-frequency local commuter rail service connecting it with Tel Aviv Center and HaHagana is an acceptable substitute if it saves a lot of money. And second, Israel Railways runs very inefficiently, partly because of single-tracking and partly because of the use of slow-accelerating diesel locomotives. Peak traffic on the two-track mainline, excluding the third track (which is run as a captive single-track commuter line), is still in the single digits of trains per hour. While my plan calls for 10-minute peak frequencies on each of 5 branches, I believe that for a long while, several branches could make do with 20 minutes; with high-capacity signaling, and the use of the third track for emergencies if a train is late, 30 trains per hour are possible, permitting space for commuter trains as well as the four hourly intercity trains to Haifa, two to Beer Sheva, and future trains to Jerusalem. 4. Too much service to the north. The way the map is presented, without extra proposed extensions, the best-served part is District 6, which has almost no residential population: counting transfer stations twice and jurisdiction-boundary stations as belonging half to each jurisdiction, it has 1.5 stations for 4,600 residents, or 1 per 3,000. But the second best is District 3, the Old North, and even Herzliya is better-served than District 8, South Tel Aviv. It’s an unfortunate fact that Herzliya’s train station is located on a pedestrian-hostile road, between the two centers of Herzliya and Herzliya Pituah and beyond walking distance to both, requiring considerable additional construction; but it’s also possible to either eliminate the Herzliya Pituah commuter rail branch or cut the Jaffa Line to KKL Junction. The Old North needs this much service, because of the high demand for bus service along both Dizengoff/Ben Yehuda and Ibn Gabirol, as well as the presence of several major retail and entertainment centers, such as the Port, the Marina and waterfront hotels, and Dizengoff Center, making the neighborhood more than just residential. 5. Not enough service to the south, especially Holon. The official plan calls for building a second line going north-south from Tel Aviv University to Holon and Rishon LeZion, giving two north-south branches to the south (including the initial one to Bat Yam) versus one in my plan. I admit that the indirect service to Holon is problematic, but counter that the city is substantially less dense than Bat Yam, and moreover the east-west orientation of the Jaffa Line connects the two cities while giving Holon a transfer to a direct mainline rail connection to Tel Aviv. Rishon LeZion is completely cut from my subway plan, but gains a centrally-located commuter rail station. South Tel Aviv has relatively little service, too, since the Jaffa Line and HaTikva Line have stops just outside it. The alternative I proposed within the map file, in which HaShalom Line is extended two more stops to Old Jaffa while the Jaffa Line is rerouted along the more southeasterly Shalma Road alignment, provides several more South Tel Aviv stations and makes Central Bus Station the Jaffa/HaTikva transfer point, at the cost of a detour that lengthens end-to-end trips as well as about 3 km of additional tunneling. In either case, the center of South Tel Aviv today is close enough to Central Bus Station to be serviceable, even if it’s only by one line rather than two. 6. Tight timed transfers. Unlike the simply-connected lines branching to the north, the lines to the south have multiple mergers, to be dealt with using timed transfers at Lod and Lod Junction. The plan is, using a 20-minute clockface schedule, to have Airport Branch trains leave 4 minutes before mainline Lod trains, be slowed down by the airport detour and the extra stops, and have a timed transfer with the Eastern Line at Lod Junction, which then has a timed transfer at Lod. This corresponds to a 4-minute slowdown as planned, but requires two successive transfers. I do not know to what extent this is robust, although given relatively low frequency per branch, I do not think it’s a trouble on a railroad with reliable trains and level boarding. Israel’s current diesel rolling stock is unreliable, but this can be fixed with EMUs, and there’s already level boarding. 7. Station locations. I tried keeping station spacing to one per kilometer, but ended up finding more good locations, so station spacing is slightly narrower. More fundamentally, at several spots, mainly east of Ayalon, I chose station locations based on destinations rather than street intersections. The tradeoff is that the destinations can provide better waiting spots than an intersection of two wide roads built for high car speeds, and by definition have something within walking distance, but street intersections make it easier to run connecting buses. 8. Quibbles on termini. These I am happy to be convinced about, including the eastern termini of HaTikva Line (on Twitter, Moshe Schorr proposes avoiding Kiryat Ono, and instead swerving southeast to serve Or Yehuda and Yehud), the southern terminus in Ashdod (it is possible for trains to enter the city on viaducts and serve it more centrally), and extensions or cutbacks to lines already mentioned. 9. Quibbles on routes. As with the termini, I am happy to make changes. 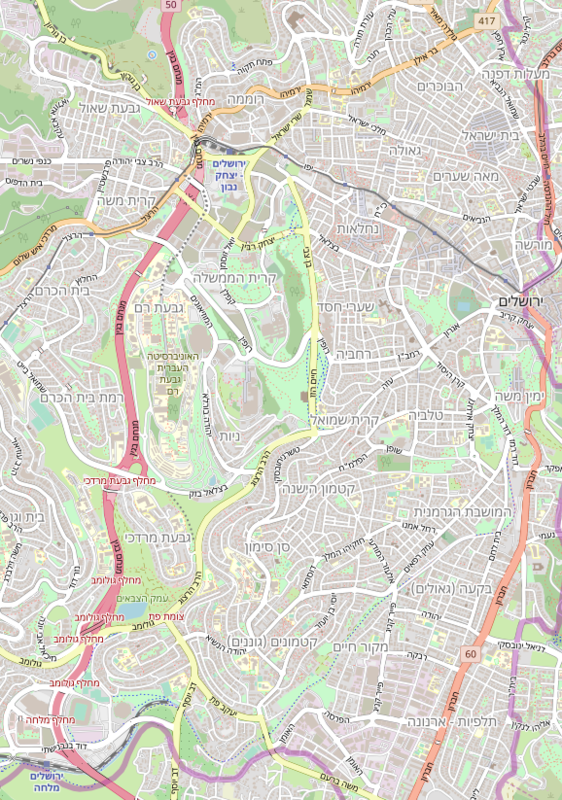 These include the route through Ramat Aviv (the current map provides a stop on the south side of the Tel Aviv University campus, but it’s possible to instead take two sharp turns and serve Ramat Aviv Mall), and the routes of HaShalom and HaTikva lines through Ramat Gan and Givatayim, which could both be moved south. There are no compelling destinations west of the eastern anchors at Bar Ilan and the Bakum/Kiryat Ono and east of the neighborhoods abutting Ayalon such as HaTikva, which makes the routes more flexible. The first two objections are the most fundamental, and the ones I feel the most strongly I am right again. The others are smaller changes, in descending order of importance, and do not conflict with the concept of an E-shaped rapid transit system supporting a single frequent S-Bahn spine. In certain circumstances, opposition comes from people living in other areas, who are aghast that an area they don’t live in is getting so much investment. This is more likely to happen when there’s heavy public involvement in development, but, since upzoning an area is a public decision (as opposed to unthinkable across-the-board zoning abolition), opposition can sprout anytime. One common thread to NITBY opposition campaigns is that NITBYs view housing as a good thing, and want it redirected to their areas. Another is that they self-perceived as ignored by the urban elites; this is common to both right-wing populists and left-wing ones. Since the process is heavily public by assumption, the price signal telling developers to build in the center of the major city is irrelevant, and this encourages the government to build more low-value peripheral projects. The first example of this is when the process actually is public: subsidized affordable housing. As discussed by Daniel Kay Hertz, in Chicago, affordable housing regulations require developers to pay a fee to a dedicated affordable housing fund, which then uses the money to develop or buy housing and rent it out at subsidized rates for moderate-income residents. To minimize the cost per affordable unit, the fund builds the units in the cheapest neighborhoods, i.e. the poorest ones, exacerbating housing segregation. As Payton Chung explains, the low-income housing community networks in Chicago support this arrangement, because they are based in the neighborhoods where this affordable housing is built. This is not as self-serving as the examples I will include below, since the community groups want to see the most number of housing units built at a given cost; but a common feature of NITBYism, namely that the NITBYs view housing as a good rather than as a burden imposed by outsiders, is present here. In Israel, NITBYism does not have the cost defense that it does in Chicago. Zoning in Israel is prepared by municipalities but must get approved by the state. This means that it is geared not only toward providing services to Israelis (such as cheap and orderly housing) but also toward national goals of Judaization. The worst NITBYism is not affecting Tel Aviv, but Arab cities, where the state refuses to approve zoning plans; since independence, not a single new Arab city has been built, except to house Bedouins who the state expelled from their villages after independence, and plans to build the first new Arab city are controversial on segregation grounds. This is while the state has built many new Jewish cities from scratch, often in peripheral areas in order to ensure a Jewish majority. However, NITBYism afflicts housing in Tel Aviv, too. Although the state could if it wanted declare a housing emergency and force upzoning in Tel Aviv, it does not. There are few permits for new apartments in the Tel Aviv District (though more new housing sales): only 5% of the national total (including settlements), as per the pie chart on page 17 of the Ministry of Construction and Housing’s report and the more complete (in English) data on page 49, compared with a national population share of 16%; the Center District, consisting of Tel Aviv suburbs (though not the richest and most expensive, such as Ramat HaSharon, which are in the Tel Aviv District), has 22% of national permits, about the same as its share of the national population. This is not just NIMBYism in Tel Aviv, although that exists in abundance. Local politicians from peripheral towns demand local construction, and view Tel Aviv construction as something useful only to outsiders, such as foreign speculators or the urban elite. During the housing protests of 2011, there was widespread debate on the left about what solutions to offer, and people representing the ethnic and geographic periphery were adamant that the state build and preserve public housing in peripheral towns and not concentrate on Tel Aviv, which they identified with the secular Ashkenazi elite. A common thread in housing and infrastructure debates to both working-class Jews from the periphery and Arabs is the demand for a policy that would create jobs and housing in their hometowns, rather than build infrastructure that would put them in the Tel Aviv orbit. Of the above examples, in Chicago the NITBYs self-identify as leftists, and in Israel, the NITBYs who want local housing rather than Tel Aviv housing either identify as leftists or identify as economic leftists and support the right on security and ethnic identity issues. However, the populist right is not immune from this. Right-wing supporters of suburbs who oppose cities for what they represent (diversity, usually left-wing politics of the kind they associate with the liberal elite) may also oppose urban upzoning. The best example of this kind is Joel Kotkin’s opposition to upzoning in Hollywood, which sounds like a criticism of government projects until one realizes that upzoning simply means developers are permitted to build more densely if they’d like. Now, Kotkin is pro-immigration, setting him apart from the main of right-wing populism, but in all other aspects, his paranoid fear of urban liberal elites imposing behavioral controls on ordinary people would be right at home at the UK Independence Party and its mainland European equivalents. Kotkin is also just one person, but his views mirror those of Tea Party activists who equate dense urbanism with an Agenda 21 conspiracy, to the point of conflating a phrase that means building new suburbs with a plan to forcibly relocate suburbanites to central cities. I do not know Japan’s regional patterns of politics well, but I know Ontario’s. In Ontario, there is not much us-and-them politics regarding Toronto. There is such politics regarding the inner parts of Toronto – Rob Ford was elected on the heels of an outer-urban populist backlash to David Miller’s urbanism, including the perception that Miller was fighting a war on cars. But there’s none of the hatred of the central city and all that it represents that typifies politics in both Israel and the US. Hatred of the city in the US is right-wing (though within the city, hatred of the gentrified core is often tied to left-wing anti-gentrification activism), and hatred of Tel Aviv in Israel is generically populist, but in both cases, the us-and-them aspect encourages NITBYism. In the most expensive American cities, this is not a major problem. Anti-urban populism does not have enough votes to win in New York and California, so state control of zoning in those states would not produce these problems. The Tea Party disruption of zoning meeting I brought up above happened in San Francisco suburbs, but did not have an effect on planning; I brought this example up to show that this political force exists, even if in that specific locality it is powerlessly weak. In those areas, local NIMBYism is a much bigger problem: many New York neighborhoods were actually downzoned in the Bloomberg era by local request. The primary problems that would plague state-level decisionmaking are corruption and power brokering, in which politicians hold even straightforward rule revisions hostage to their local pet projects. The us-and-them politics of Upstate and Downstate New York contributes heavily to power brokering, but Downstate’s demographic dominance precludes ideological choking of development. Within the US, the risks of NITBYism are different. First, in the cost tier just below that of New York and California there are city regions in more moderate states, for examples Philadelphia and the Virginia suburbs of Washington, or possibly Miami (where the county-made rules have allowed aggressive new construction, mostly urban, which Stephen Smith credits to the political power of Cuban immigrants). And second, zooming in on different neighborhoods within each expensive city, the Chicago example suggests that if New York and other expensive cities begin a major program of public housing construction, the community organizations and the populists will demand to spread construction across many neighborhoods, especially poor ones, and not in the neighborhoods where there is the most demand. As I noted two posts ago, there is a political economy problem, coming from the fact that the politically palatable amounts of construction are not transformative enough to let the working class live in market-rate city-center apartments, not in high-income major cities. Israel could semi-plausibly double the Tel Aviv housing stock; even that requires housing forms that Israelis associate with poverty, such as buildings that touch, without side setbacks. This would allow many more people to live in Tel Aviv, but they’d be drawn from the middle class, which is being priced out to middle-class suburbs or to working-class suburbs that it gentrifies. The working class in the periphery would be able to move into these closer-in suburbs, but this cascading process is not obvious. Worse, from the point of view of community leaders, it disrupts the community: it involves a churn of people moving, which means they end up in a different municipal fief, one with leadership the current suburb’s leaders may be hostile to. For essentially the same reasons, subsidized housing in the center produces the same problems. If Israel builds a massive number of subsidized or rent-regulated apartments in Tel Aviv, there will be immense nationwide demand for them. Few would serve the residents of a given peripheral suburb, and there is no guarantee anyone would get them. On the contrary, in such a plan, priority is likely to go to downwardly-mobile children of established residents. At the 2011 protests, the people who were most supportive of plans to lower rents in Tel Aviv specifically were people from Tel Aviv or high-income suburbs who wanted to be able to keep living in the area. The community disruption effect of offering people the ability to live where they’d want would still be there. Thus, all the incentives line up behind periphery community leader support for building public housing in the periphery, where there is little demand for it, and not in the center. Even when housing is universally seen as a benefit and there’s no NIMBYism, politics dictates that housing is built in rough proportion to current population (since that’s where political power comes from) and not future demand. Abolishing zoning is one way to cut this Gordian knot; it is also completely unpalatable to nearly everyone who is enfranchised in a given area. Allowing more private construction is the more acceptable alternative, but leads to the same problems, only on a smaller scale. It really is easier for community leaders to twist arms to demand veto rights and local resident priority than to push for sufficient citywide upzoning to alleviate the price pressure. But in an environment with weak NIMBYs and few NITBYs, fast growth in urban housing is possible.